Today, we tend to spend a lot of time in front of the screens, be it the Computer, laptop, TV or even mobile phones, which leads to the back pain and thus, ignites various other issues! Even the long office hour sittings with the eyes glued to the computer tend to have a negative impact on our health and body posture. 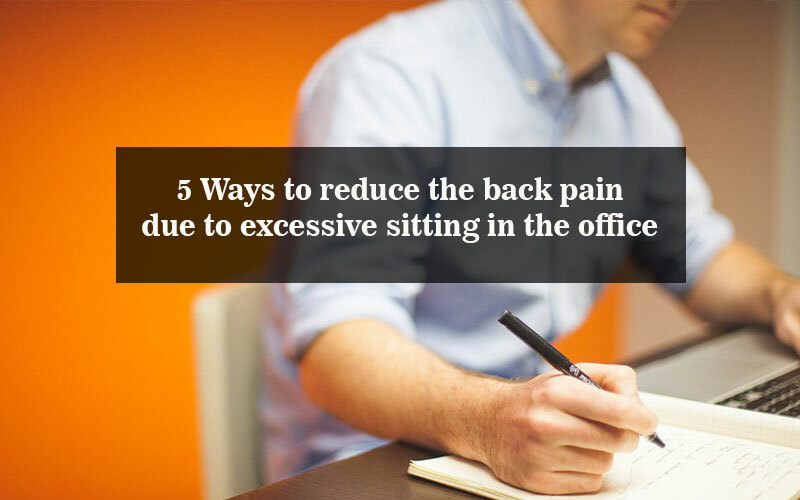 So, here are five ways in order to minimize the back pain caused by excessive sitting in the office! Invest in the office desk that is portable and adjustable, owing to the ergonomic environment at the office. Purchase a desk that can be used either way i.e while standing as well as while sitting relaxed in the cushioned chair while working with an apt positioning of the keyboard and monitor accordingly. In this way, you are not bound to keep glued to that chair while working! The most appropriate posture while sitting is when your feet touch the floor flatly and when you have a slight bend at your thighs while sitting on the chair. This way it helps to place your entire weight on your “sitting bones” and thus, prevents your slouching, round back and shoulders which helps in keeping the posture perfect! It is favorable to keep the keyboard such that your elbows bend at approximately 90 degrees while using it and you use it effortlessly. If the keyboard is placed at a lower angle you are bound to slouch your back in order to operate it which might lead to a severe backache with the passing time. So, make sure to keep the keyboard up on the table if in any case it’s placed below 90 degrees, along with the mouse and mouse pad. Keep in mind to place the monitor directly at the height of your chin. If the monitor screen is down, then you have to bend your neck to operate it which might lead to severe neck stiffening and straining. So, make sure the monitor is at a comfortable height that does not make you strain any part of the body while operating it. The large screen monitors must specifically be placed just in front of you in order to avoid the cumbersome operation! Do not just keep sticking to your chair as this constant sitting hails a lot many problems, so, make sure you walk after every 30 minutes. The longer you hold yourself at the chair, the more your posture is to suffer! In addition to the above steps, you can also curb the excess use of the phones as they make you bend your posture to operate them, excercise daily in order to stay fit and have a healthy diet so that your constant sitting prevents the unnecessary weight gain!